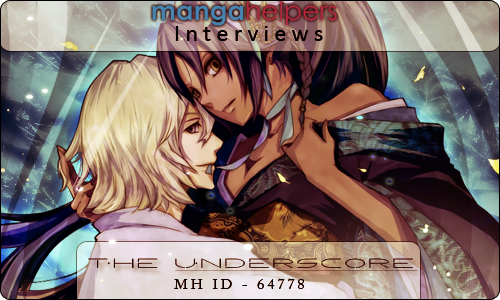 Hello, dear Mangahelpers community! As you probably know by now, we have STARs (scanlator, translator, artist, reviewer) in our community, and like in any healthy community, everyone wants to know who are the STARs and what they do. I had the pleasure to talk with one of the most consistent STARs of this community, I'm sure most members, and every Bleach fan here knows him. But before we start, I have to thank another STAR, this time an MH Artist for the wonderful banners that he provides. Thanks a lot ~Coffee~! Also make sure to visit MH's Manga Reviews section, submit your reviews of your favourite manga, or just start reviewing chapters. Don't forget, you'll get a nicely colored username, and the chance to be on the Front Page as well! Hello, The Underscore, before we start can you offer us a brief introduction of yourself, and your activity on this site? Is reviewing or text writing in some form related to your real time job? The reason I ask this is because I noticed a great ease when you describe certain situations and panels in you reviews. Great ease you say, haha, you have no idea how hard it is at times. Well, it is related to my work in a way, I started writing reviews during my studies. I had to read and write a lot of texts. The reading was mainly in English and writing in English was required some times as well. My study was on educational sciences and I want to write teaching methods. Also, my current job still requires me to write a lot as well. The reviews, however, are the only thing I still write in English. But as I have to be able to describe things in order to explain them to users of a learning method, I have to know how to describe things and situations. Well, I guess I'll ask you about the mangas you read. Was Bleach the first? You'd think that, but it wasn't. I got into manga through anime. The first manga I read was Naruto, actually, but when watching Naruto on Youtube at the time, the comments had plenty of people saying Bleach was better and whatnot, so I started watching Bleach as well. The Bleach manga followed, in turn One Piece was added my reading list, and I was hooked. I see, funny how most people start reading manga in this order. Do you have any plans to review one those 8 titles, other then Bleach? I'd love to review another title, but sadly I've got little time with my job and sports getting in the way. But truth be told, I want to find some time to at least write one review for one of the titles that deserve a bit more attention. That's sad, because in the past few years you've been the most consistent reviewer on the site. You don't post much elsewhere, so I guess time is really an issue, but how often do you get outside the review section? I honestly haven't been outside the review section for over a year now. Sometimes I comment on other reviews, if I have the time that is. Do you like a certain series so much that you would like it to be reviewed by someone? Well, guess I'll list the manga I read on a weekly basis before I give that answer. Unsurprisingly, I read the big 3 of course (Bleach, One Piece, Naruto). Then there's Katekyo Hitman Reborn!, Fairy Tail, Mahou Sensei Negima is fun to read as well, and finally there's Bakuman. Now and then I do read a couple of chapters of a series in one go, but I don't read those on a weekly basis. Of those manga I'd like to see Fairy Tail or Reborn reviewed by someone, as the Big three already have people reviewing them. Fairy Tail is definitely one since the current arc is pretty good. Do you have any advice for beginners in case they will start reviewing one of these titles? What's the most important quality a reviewer should have? All I can say about starting to write reviews is that it is hard, especially considering FT and KHR don't have review sections (yet). But I guess the most important thing is that you do it the way you want to. I'm thinking of writing reviews for Reborn and Fairy Tail in order to inspire others to continue writing them, but that brings me back to the issue of time, or the lack of it that is. That brings me to the most important piece of advice: make sure you have time to write the reviews! That's definitely not true! It's clear that your reviewer skills are great and because of it...people might ask why Bleach? I'm asking this, because Naruto and One Piece are more popular, so indeed why? Haha, well this also has something to do with how I became what you call "the most consistent review" in the first place. Like I said, I first joined Mangahelpers to reply on one of Gigantor's reviews. At the time, Bleach had two people reviewing it on a weekly basis: Gigantor and Sahugani. They actually managed to review two titles if I recall correctly. Basically I'd read Bleach and then their reviews just for the heck of it. So when the two of them stopped, Bleach suddenly didn't have any reviews posted on Mangahelpers anymore. Naruto had the same thing a couple of weeks before that, but someone else already picked it up before I even considered writing reviews. As time went on, I missed what Gigantor and Sahugani brought to Bleach for me, thus I decided to take up my pen and to write my first review. The fans definitely enjoy what you do, so good decisision! How did you even find Gigantor or MH in the first place, and don't say spoilers, please! No, no spoilers. MH used to release scanlations back in the days. MH also announced whenever new chapters came out and who released them. So going from using it as a notice board, I just decided to see what else people were doing on this site. I found the review sections, read the reviews and was greatly entertained by them. Gigantor (Gigantor21) was one of the people posting at the time, so that's how I found out what MH had to offer. Basically that's how I got into MH. I see, returning to the reviewing of Bleach itself and maybe some of the Bleach fans, might bash me, but I'm returing to the consistency that you've shown. How could U endure the manga until now, since the SS arc to be more precise, what kept you motivated to continue writing reviews? Haha, I should've seen this one coming...back to why I started writing Bleach reviews then. I felt Bleach deserved some love, so I decided to write reviews until someone else would take over. The thing was, that a lot of the reviewers bailed on Bleach or decided to write for other titles (here's looking at you Benelori:p ). I'm a bit stubborn when it comes to Bleach, I suppose, but I saw Kubo's love for his work, his love for the characters in his work. Kubo suddenly decided to draw things out as much as possible, believing it would be enough to keep his fans entertained, but sadly, this gave a lot of chapters with little to no story progression. In spite of this, I felt there were things hidden in the chapters, perhaps not bound to the plot but at least to the characters themselves. Believing Kubo would turn things around sooner or later, I just kept on reviewing. Knowing that people were reading my reviews and that the reviews helped them to grasp certain things they didn't notice while they read the chapters, also helps a lot to keep on reviewing. You said that time isn't really your ally but aside from time what is your biggest enemy or the most difficult thing in reviewing? Let's see, the biggest issue when it comes to writing reviews besides time...I'd say my own thoughts, really. I think you may have noticed how lengthy I can be. Even with Bleach chapters that hardly have any content, I often have a hard time to write everything down I come up with as my thoughts pour out at an uncanny pace, so that doesn't help. Yeah, but it's good. While many prefer short reviews, I like longer reviews so I'm definitely your fan in terms of style. By the way, have you visited the Manga Reviews section? Bleach has its own thread there. Maybe you can drop by sometime with a review there about the entire manga. I know I speak for all Bleach fans when I say I'm eagerly awaiting such a review from you. But besides your reviews, I know that fans are most curious about what happened to the Underscore Mask:p? I suppose I can try to find some time again soon, I managed to make time for this interview after all. As for The Underscore Mask... ah, yes, why didn't I use him in the answer on what a true reviewer needs :p. The Underscore Mask has by no means been unmasked to be me, as that would just be too silly for words. No, he has returned home, to the isle of reviewers there he's training to take over my place once more if I am ever to make another stupid promise which ends up with me not being able to review even though I actually could. He was a much greater prinny and reviewer than I could ever be...it's the mask, you know. And he had plenty of adventures of his own that made it easier for him to relate to what happened in the chapters as well. You can find those adventures in his reviews. Ok, so given the circumstance on being on the Front page and all, you have the opportunity to relay a message to MH fans, Bleach fans, family, dog, etc... So if you have any final thoughts, reviewer wisdom then please share it with us. To all MH fans out there, make sure to support your favorite manga and start reading Bleach if you haven't already! To my family: What are you doing on this website?! Read a chapter twice, then read it again, read it backwards and start penning down your thoughts on each panel, write them down in chronological order, and there you have a review to post! Thank you very much!I don't know what your family is doing here, but I'm sure that the great family known as MH is grateful for you agreeing to do this, so thanks again and we will be looking forward to your reviews. You're welcome! I hope people will keep reading my reviews, perhaps that can persuade me to do another title somehow. See you around! So that was it folks, we got a tad bit closer to the person that is The Underscore. I'm also seizing this opportunity and urge everyone to follow his reviews(click here), or why not starting some reviews on your own. In the name of The Underscore and myself, I thank you all for having the patience to read this, I hope you guys enjoyed it! Loved that "STAR" thing XD Pretty clever name! Very nice review. Even though Bleach kinda lets me down at times due to no plot development I totally understand what he means. Every character reaction, move or words even though they may seem useless and a waste of space, those contribute to create their personalities little by little.